We do have Bunnywe’en pictorial and a very cool story on Ears O’Fluffin (warning: bring tissues). We also have The Bossy Bunny’s tale on her terrifying choking experience from Suzie herself. Two author interviews for the books ‘Basajaun’ and ‘Fear And Terror Stalk The Museum’. An unboxing of a Rabbit Paradise Subscription Box (which I failed at streaming but still wanted to show you all the cool stuff inside). A cool pictorial/article on Mrs. Obi’s glorious summer vacation, and a little bit of a rant from me (sorry, had to be done…it’s a big pet peeve of mine). And to be a bit more mobile friendly, we’ve started publishing in single-paged formats. Plus some of my thoughts on euthanasia. The featured rabbit for this issue is, selfishly, Lilo. 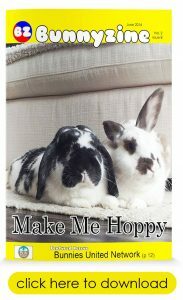 I haven’t had my own bunny ever featured and I think Lilo’s earned it…and because of Lilo’s passing, a new pictorial entitled “Cheer me up” is in this issue and is comprised with the squee-ful photos that you have submitted. Lastly (but not least), Bunnyzine takes a moment to say goodbye to Marshmallow; the beautiful bunny that inspired the book “The Forgotten Rabbit” by Nancy Furstinger. August’s issue is here and I am loving the variety packed in this one. First, the ADORABLE interview with Love Buns: cc and Gus (seriously, it’s so cute). We have sections on volunteering, passion projects, pokemon go, wild bunnies, the continuing mystery of Ears O’Fluffin, a cool repurposing of a dresser into a bunny home, an exciting new rabbit mystery subscription box, and the dark side of those giant inflatable rabbits that everyone loves. We also cover a very important topic that deserves mentioning here as well. Bunnyzine really, truly, needs your help in order to keep going. While we love our nearly 200 regular readers, we are far, far, away from the readership size that attracts advertisers. We really need your help in sharing Bunnyzine with others. Please share this post wherever you are permitted to. We don’t need money. We need readers. It’s free and fast for you to help us. I hope you will see the efforts we put into each issue would hold enough value of a sharing click. Hey everyone! It’s here! It’s here! And it’s got a lot of content. 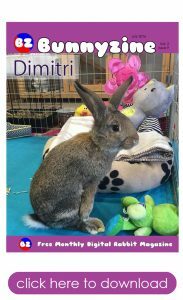 We have our featured bunny, a beautiful splay-legged sweetie named Dimitri. We also take a moment to say goodbye to bunnies we’ve lost in the harsh month of June and a bittersweet introduction to a bunny who is lucky enough to be in the care of Ocean’s parents. It’s definitely a packed issue. And it’s free. Just a reminder that we have ended donation collections for a monthly featured rescue. We are focusing our efforts on gaining more readers so that we can get advertisers and use their money to fund rescues. This means it’s incredibly important to us that you download this issue and share the link with others. Imagine a bunny-lover’s nightmare come true. Being on vacation to hear the news that your town is on fire. Even worse, the person looking after your bunny is at work and because of a forced evacuation, they cannot get to your home to save your bunny. Even if you were to leave your vacation, they won’t let you into your home. What do you do? This was a reality for a resident of Fort McMurray that was engulfed in flames last month. 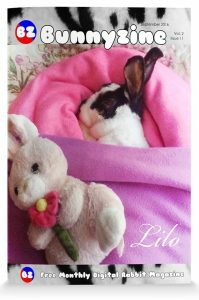 We had a chance to speak with them about the event, and how against all odds, her bunny was saved. Find out all about it in our June issue! This issue is fantastic. It ranges from the breathtaking artwork of David Joaquin to an ongoing large rescue. We get visit from Mrs Obi who shares with us a recipe from bunnyapproved.com. It’s also the 1-year anniversary for BZCast. May’s issue is out and you will squee your brains out. 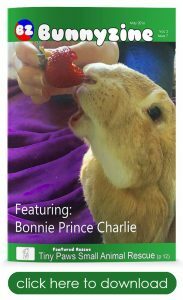 Some of that squee might be from our featured rabbit, Bonnie Prince Charlie and some might be from the MASSIVE bunny rescue operation by Freedom for Farmed Rabbits. Mrs Obi has a secret to share with you. Our featured rescue is Tiny Paws Small Animal Rescue whom you may recall as one of the two rescues that helped us out with The Abandoned Family. Let’s show them some support. 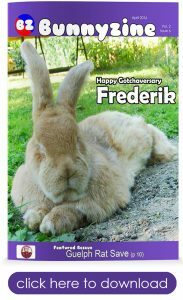 Brand new issue featuring Frederik!!!!! Our featured rescue is Guelph Rat Save whom has helped us by taking on TEN of the Thirteen bunnies from The Abandoned Family. This issue has a LOT of content, including a surprising update that I learned about The Abandoned Family (I managed to obtain some information from someone who knew the person that abandoned them, the update is in the Featured Rescue section). And want to know who won the Bunny Burrow Easter Contest? The winner is inside this edition. Plus we take a closer look at Chip, the bunny who inspired the logo for Bandaids for bunnies. And don’t forget that Small Critter And Rabbit Enrichment Toys is offering a double value deal (up to $100): Buy products for Guelph Rat Save and the value of your order doubles, giving Guelph Rat Save TWICE the gifts. This is an issue worth grabbing, so click the link at the top of this post to get your issue today (it’s free). The issue is on time! Woohooo! We’ve got a great article on E.C. All this and there is STILL more. Come grab your free issue. Love is in the air and we are delighted to bring you another Valentine’s couple. 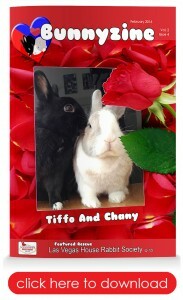 This year, we have Tiffo and Chany. This adorable couple has given us the cutest interview accompanied with some very gorgeous pictures. 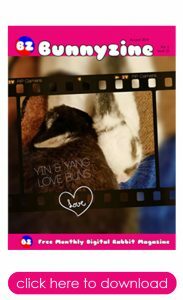 and a beautiful pictorial of bonded bunnies in love sent in by readers. 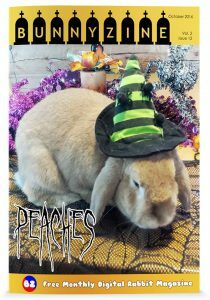 Our featured rescue is the Las Vegas House Rabbit Society. 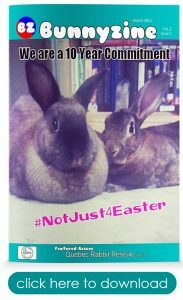 If you want to donate to Las Vegas House Rabbit Society, you can donate between February 1st to February 29th (money contributed after this time frame will stay with Bunnyzine) you can click this link to donate to Las Vegas House Rabbit Society. This 42 page Valentine’s issue is available to you for free! Happy New Year! 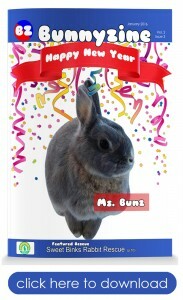 We are kicking off 2016 with the beautiful Ms. Bunz. Our featured rescue is the Sweet Binks Rabbit Rescue. If you want to donate to Sweet Binks Rabbit Rescue, you can donate between January 1st to January 31st, 2016 (money contributed after this time frame will stay with Bunnyzine) you can click this link to donate to Sweet Binks Rabbit Rescue. This 32 page New Years issue is available to you for free!